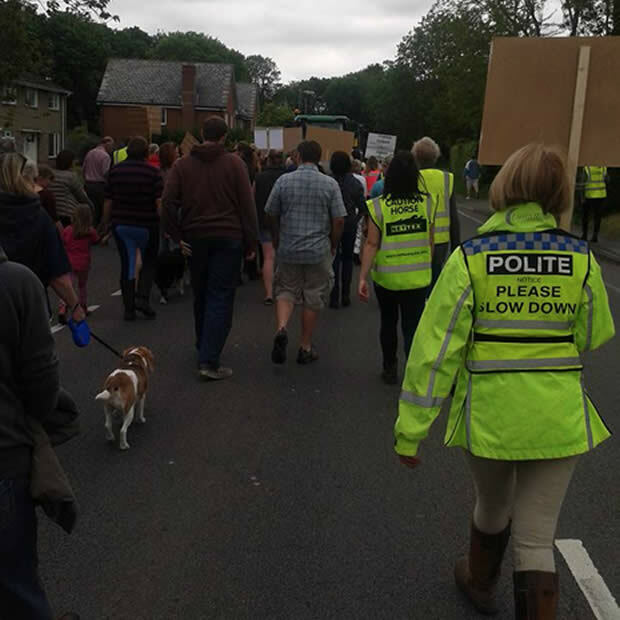 "Users unhappy with work carried out by Hampshire County Council and the South Down National Park on a local bridleway staged a protest rally in Wickham, Hampshire, on Sunday (May 24th, 2pm) to raise awareness over safety concerns and the quality of surface.."
People are now voting with their feet, after thousands of people signed petitions, and over 250 people attended a local public meeting to voice their concerns to the council over the insensitive works being carried out to the disused Meon Valley railway. This once pleasant local bridleway was until recently regarded as a safe haven for many local user groups. In a bid to secure central government funding under a cycling initiative, it has now been extensively widened and hardened, using large sharp stones that can be dangerous to equestrian users forcing them onto local roads including the dangerous A32. People are also angry as many deep holes that used to cover railway infrastructure are now exposed due to the widening and removal of vegetation along the entire length of the trail. Reports have been received of serious injuries to animals that have fallen into these holes on open sections some of which are 4ft deep. 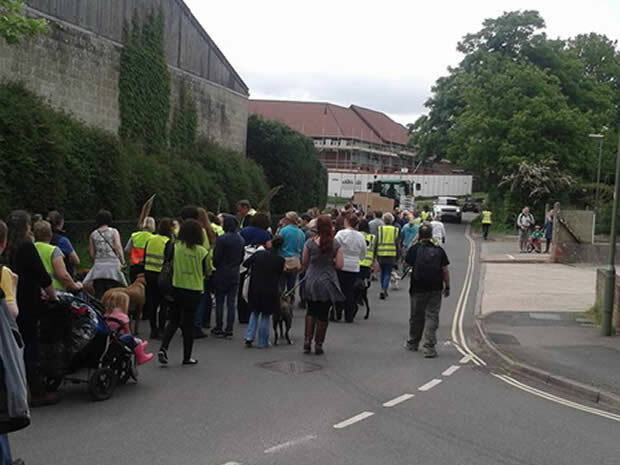 The widening of the route and extensive felling of the adjacent trees and vegetation, have also lead to concerns over the legality of the works being carried by hundreds of local residents as no prior planning permission was sought. They are also dismayed at the lack of any proper consultation and frustrated that the route is now being used by people on motocross bikes and even in cars along it since it has been widened. In response to the wide range of concerns a Facebook group was formed and thousands of people joined and a legal fund was set up that raised over £3000 within the first 48 hours. 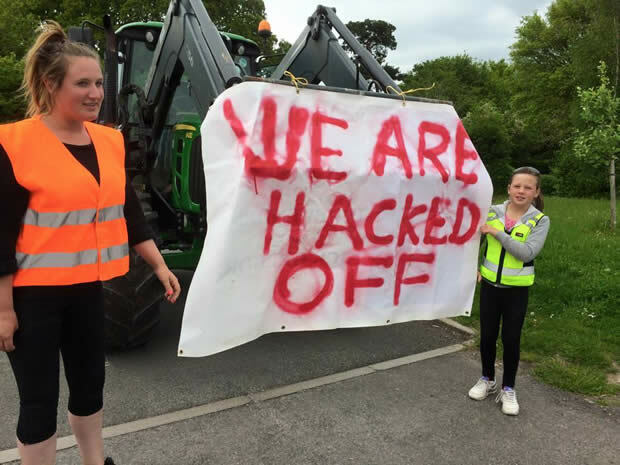 This was to help pay for a specialist barrister to establish the legalities of the works carried out, while representatives of the group try to reach a compromise with the council over a sensible and legal way forward. It is hoped that this peaceful protest will continue to raise awareness locally, and encourage HCC and SDNP to fully address safety concerns that have been raised, as well as being open to the tried and tested solution of a "split surface" to meet the needs of all the user groups. It has been suggested that if a compromise can be reached, that volunteers will walk the entire length of the line and manually remove the metal foreign objects that have recently been laid. Martin Montague, spokesman for the Facebook Save our Bridleway group, which has more than 2,700 members, said: "We are just looking for HCC and SDNP to support a sensible solution for the thousands of different users who have been effected by this work or who have safety concerns."